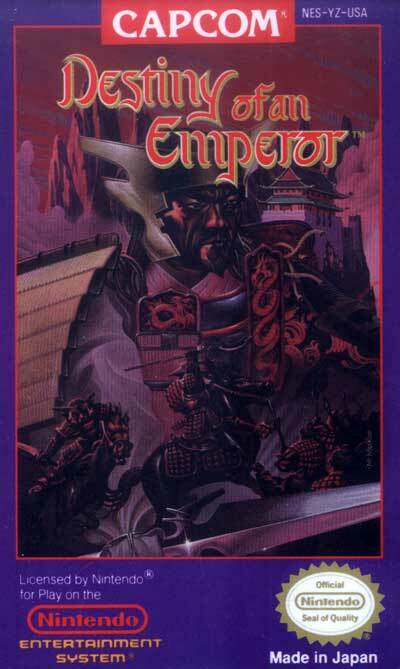 Destiny of an Emperor utilizes a number of features that made it stand above and beyond other traditional RPGs of its time. The party consists of up to 7 members, 5 of which actively participated in combat, 1 who serves as back-up to replace any dead generals following combat, and 1 to both serve as back-up as well as party tactician. The tactician provided spell-like effects that anyone in the party could utilize. Additionally, the player could capture or recruit somewhere around 120 different generals to add to his party over the course of the game. At one point, the storyline splits, and the player is free to choose which path to pursue. Both paths rejoin shortly, but at the time it presented a unique experience that other RPGs of the time (Final Fantasy, Dragon Warrior) did not offer. A sequel (Tenchi o Kurau II) was released in Japan, but sadly never made it out of Japan.